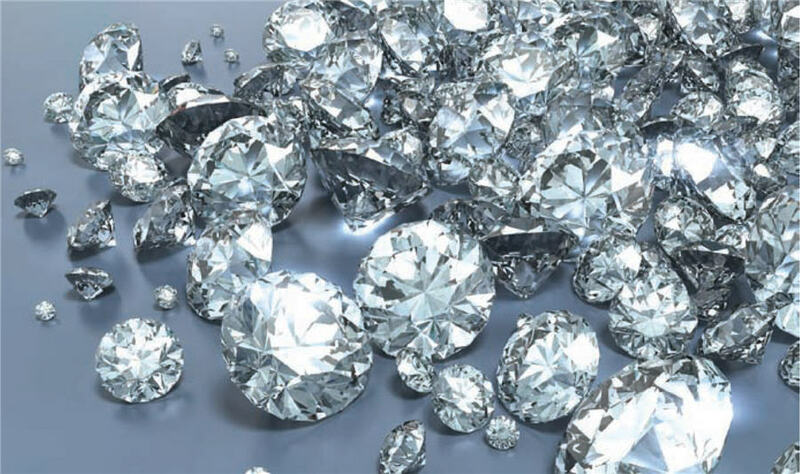 The global economy performed better than most expected in the first-half of 2016, as the world's largest diamond jewelry market, the U.S., held back on further rate hikes, and policy in China, the world's fastest growing diamond jewelry market, promoted credit creation. The U.S. Federal Reserve Bank has leaned on the side of more-dovish policy so far in 2016 after raising the fed funds rate last December, for the first time in 9 years, which fueled the S&P 500 to a new all-time high in early June after marking a multiyear low in February. China responded positively to government stimulated credit support which stabilized what had been a volatile 2015 for Chinese property and financial markets. China’s most economically advanced regions, driven by service sectors, such as Shanghai and Beijing metro areas, have showed the most improvement, but the less-developed, industrial-driven regions, primarily in the northern portions of the country,continued a lagging growth trend that first became apparent last year. De Beers' Damtshaa mine in Botswana was put on care and maintenance earlier this year. Image source: De Beers Group. In late June, the U.K. referendum to leave the EU passed, which has since sent the pound down 11% against the dollar, and led to the BOE cutting rates on August 4th for the first time in 7 years. In the U.S. and China in particular, service sector growth trends have outpaced manufacturing, which typically suits consumer demand for luxury discretionary commodities like diamonds, more so than industrial/construction commodities, like base metals and energy. This trend was congruent with De Beer’s parent Anglo American’s most recent operational update released on July 28th which showed that in 1H 2016 diamonds represented 42.3% of Anglo’s EBIT (earnings before interest and tax) versus 30.6% over the same period last year. Over the last year or so, Anglo has been working to gear their business strategy to prioritize the diamond business, while divesting assets, such as iron ore, nickel, and coal and using the proceeds to pay back debt. Anglo’s stock has rallied almost 290% from a low in January, and is now just off its 52 week high. De Beers’ production volume in the first half of this year was down 14.8% YoY (year-over-year), consistent with the industry’s strategy to curtail diamond supply to the market in an effort to mop up excess stock in the mid-stream and downstream segments of the industry chain. However, De Beers' sales volume was up 29.2% through the end of June, a demand figure which is indicative that the supply strategy is working and that the industry’s excess inventory levels have been diminished. The company's most recent sale ending the week of July 29th (not included in 1H results), showed a 160% increase in diamond value sold over the same sale last year ($520M compared to ~$200M), which is especially noteworthy given the seasonally subdued nature of diamond demand this time of year. The market's response to the sale results appeared underwhelming, and it feels as if the industry sentiment at the moment is perhaps more pessimistic than justified, as many expect demand to tail-off a bit going into year-end, although data remains optimistic. 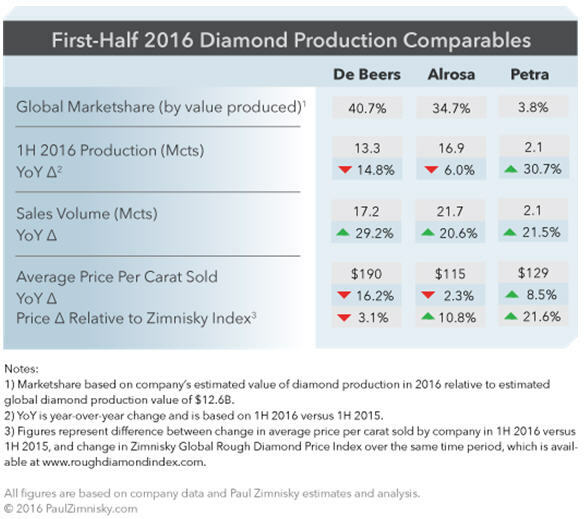 De Beers' average price per carat sold in the first half of 2016 was $190, down 16.2% versus the same period last year. 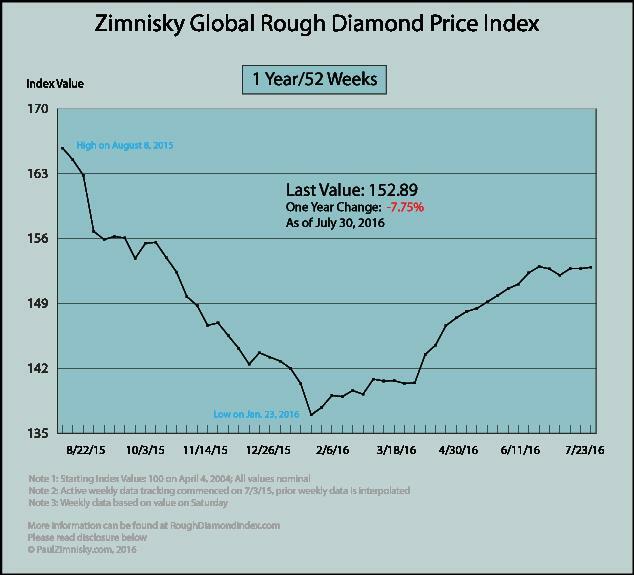 This compares to a 13.1% decrease in the broader Zimnisky Global Rough Diamond Price Index over the equivalent period of time. The relative weaker figure achieved by De Beers is most likely a result of a lower-quality product mix sold, mostly attributable to a 17.1% and a 69.5% decrease in Namibia and Canadian production, respectively, the company’s two highest-diamond-quality producing divisions, on an average price-per-carat basis. Namibian production was impacted by one of the division’s offshore mining vessels undergoing an extended period of planned in-port maintenance, and Canadian production was most significantly impacted by the non-profitable Snap Lake mine being put on care-and-maintenance in December of last year. Russia-based Alrosa’s (RTS: ALRS) production decreased 6.0% in 1H 2016 over 1H 2015, but the company’s sales volume increased 20.6% in the period, consistent with the directional trends in De Beers’ figures. Alrosa’s average price per carat sold in the period decreased 2.3% to $115/ct. 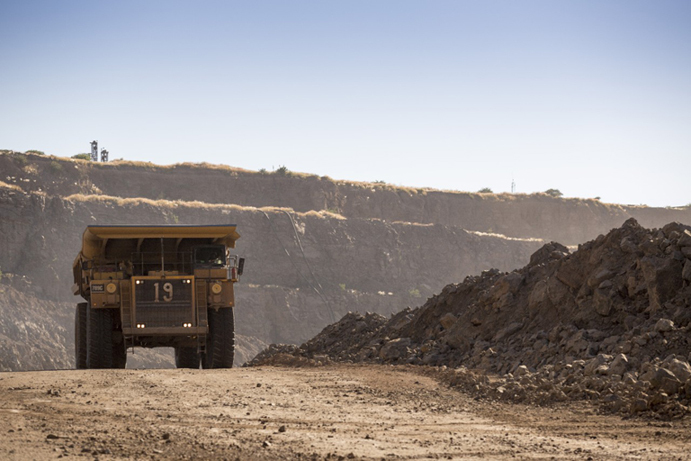 Petra Diamond’s (LSE: PDL) production increased 30.7% in the first half of the calendar year, mostly attributable to the acquisition of a South African tailings operation from De Beers in January. Without the acquisition factored in, Petra’s company wide production still increased 2.8% in 1H 2016 over the same period last year. Petra’s sales volume increased 21.5%, and the average price per carat sold by the company increased 8.5% to $129/ct., mostly attributable to a higher-quality production mix sold. Petra is a relatively small operator and is only about 1/10 the size of De Beers and Alrosa on a revenue basis. According to the Zimnisky Global Rough Diamond Price Index, rough diamond prices are down 7.8% over the last year, up 7.1% over the last 6 months, up 8.9% over the last 3 months, and unchanged over the last month. De Beers is 85% owned by Anglo American plc (LSE: AAL) and 15% owned by the Government of the Republic of Botswana. At the time of writing Paul Zimnisky held a long covered-call position in Dominion Diamond Corp., BlueNile Inc., and Tiffany & Co. Please read full disclosure below. Paul Zimnisky is an independent diamond analyst and consultant and can be reached at www.paulzimnisky.com.